Blog Strategy for Social Media! Home » Blog Strategy for Social Media! With a variety of social platforms available and millions of users interacting with each other on it, how to make your voice/your blog stand out and generate a good loyal audience who keeps coming back for more? Good Quality content no doubt is the foremost thing to keep in mind but it does require a few tactics to get the most of your efforts. Look for the best social networks to promote your blogs: A new social network comes out every month. It is impossible to try and share your blogs in every network. A better strategy could be to focus on just a couple of social networks where you feel your target audience is. Determine the traffic potential of that social network: If your blog post is around professional readers and businesses, you might share it on social channels like LinkedIn and Google+ since you will have more potential traffic there. If you have more of visual content, you might want to focus on social channels such as Facebook, Instagram, Pinterest etc. Analyze the traffic: Once you see the traffic inflow, analyze it to determine if your target audience is visiting the blog. Watch out for bounce rates and social networks that provide better traffic. Automate content sharing: Automation will share your new posts automatically to your selected social profiles. You won’t have to worry about sharing them manually in every channel. There are various tools such as Buffer which can schedule up to ten posts in your queue for various social channels. Word press sharing is possible by using a plugin, Jetpack. Identify Relevant And Popular Hashtags: For each of your blog post, identify relevant 3-5 hashtags. You may use services like ‘org’to identify popular hashtags related to your blog post. Limit Social Network buttons: Though it may seem tempting but having too many buttons on your blog post usually confuses readers and they end up choosing none. For most blogs, let Facebook, Twitter, LinkedIn and Google+ will be the only social sharing buttons. Share snippets or pieces of your blog without links: There are some people who do not like when a profile shares just titles and links back to their blog. It’s good to make your profiles more appealing by including ‘social media content only’. To do that, read through your content and look for key points, quotes, data points or snippets that will make great social media content and then schedule these updates by plugins. Share short tips and updates that do not make for a blog post: There is no need to write complete blog posts on any tip or idea. It’s okay to share such tips, quick stats etc to add value to your social media updates. If your snippets are useful and informative, your followers will not mind checking your blog posts too. Identify 8-10 active groups in your niche. Share your post in each of these groups. Apart from that, there are various groups organized specifically for bloggers who are looking to promote their new posts. Once you join these groups and submit your blog, other members of the community will like, share and comments on it, helping you build the audience for the post. Find tweets that contain content similar to your blog post with the help of twitter’s search functionality. Find people who have tweeted similar content and have at least 500 followers. Reply to their tweets and tell them you think the blog link will be useful to them too. DM (Direct Message), if there is someone from your follower list who have shared the same content. Ask them if they could share your blog post too. You may look into your mentions column on twitter. People who have shared your content in the past will likely share your new content too. Make twitter lists: Build twitter lists for specific content. With the help of these lists you can quickly encourage others to tweet your new blog post. You may make lists such as ‘Influencers’ or ‘Sharers’ for the people who have shared your articles in the past as they are most likely do so in the future too. Join the relevant Google+ communities to share your blog post. Search for a similar topic as your blog post. You will find a feed of people and pages that have shared content similar to your topic. Add these people to your circle. Promoting blog posts on LinkedIn: LinkedIn has groups for every professional. Share your blog on groups relevant to the topic of your blog post. Over time, look for the groups that send the most traffic to your blog and share your content in the group, every time you publish anything. Send Direct Messages to contacts: By referring a previous post of yours that contact had read, commented or shared, you may want to message the contact about your new blog post and ask them to share their views on the same. Join Community that shares each other’s blog posts: There are various communities such as ‘viral content buzz’ wherein people help each other share their respective blog posts. This is a good way to build social authority and to get traffic. Always remember, you are not promoting a post, you are building a brand, starting a conversation, establishing your reputation. Make sure your tone is in line with your image and work. Understanding your audience and writing content as per their interests is an art. There is no right way or wrong way to share your blog content. People always tell you tips what worked for them and works in general, some got success just by sharing blog links on social media and some by sharing unique content. Do not get discouraged if your audience is not growing. As is with life, sometimes the best approach is somewhere in the middle. 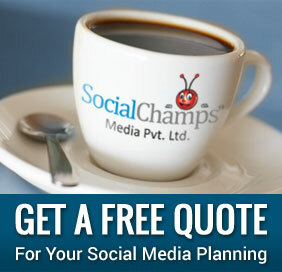 Above approaches and tips will surely help you in building sustainable traffic from social media for your blog. As time passes, you’ll learn to adapt to the strategy that fits the best for your blog and brand at large. Do share with us your tips and what really helped you in building traffic for your brand and blog. Happy Blogging!